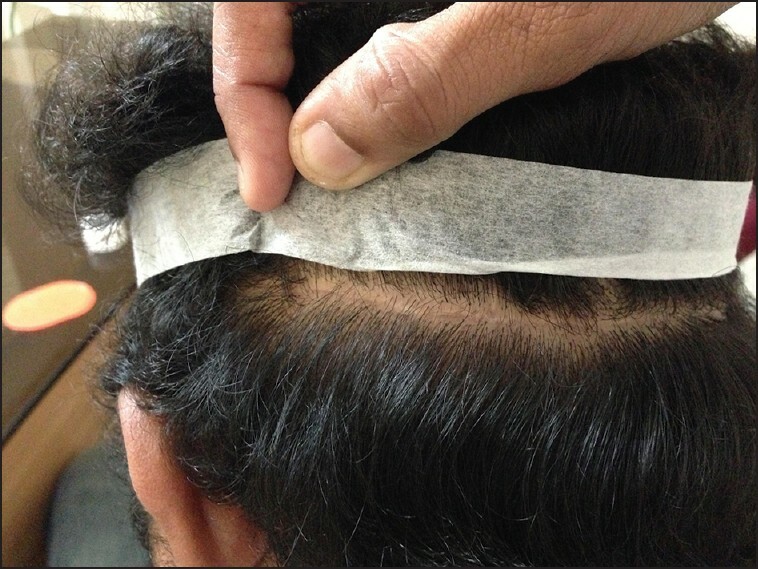 Background: Donor area closure in hair transplantation by follicular unit transfer (FUT) is being done by various techniques. This study aims to assess the outcomes of staple closure for donor area in FUT. Aim: To study the outcome, efficacy and complications of staples in donor area closure for FUT. Materials and Methods: A total of 50 consecutive patients who underwent staple closure for donor area in FUT were included in the study and their data were collected retrospectively. Patients were followed up one year after the surgery and photographic documentation of the scar at the donor site was done. Objective measurement of the width of the scar was done for all the patients. Results: The average length of the donor area was 22 cm. The average width of the scar was 1.82 mm. There was no infection or tissue necrosis at the staple closure site in any of the patients. Conclusion: Staple closure resulted in cosmetically acceptable scar, but post operative discomfort was the major limitation. The potential to conserve the hair follicles along the line of closure makes using staples worthwhile if conservation of follicles is the goal. The history of wound closure dates back to 5500-3000 BC, the origin of surgery. Early suture devices were made of natural materials such as silk, linen strips, cotton etc. With the development of synthetic polymers and fibres, synthetic suture materials were introduced. The suture material used depends upon the specific site and clinical technique as well as the surgeon's preference. The goal of wound closure is to bring the edges of the wound together not only with sufficient strength to prevent dehiscence, but also with minimal residual tension and compression of the tissue to promote healing with a cosmetically acceptable scar. Staple closure is one of the methods of closure of the donor area. 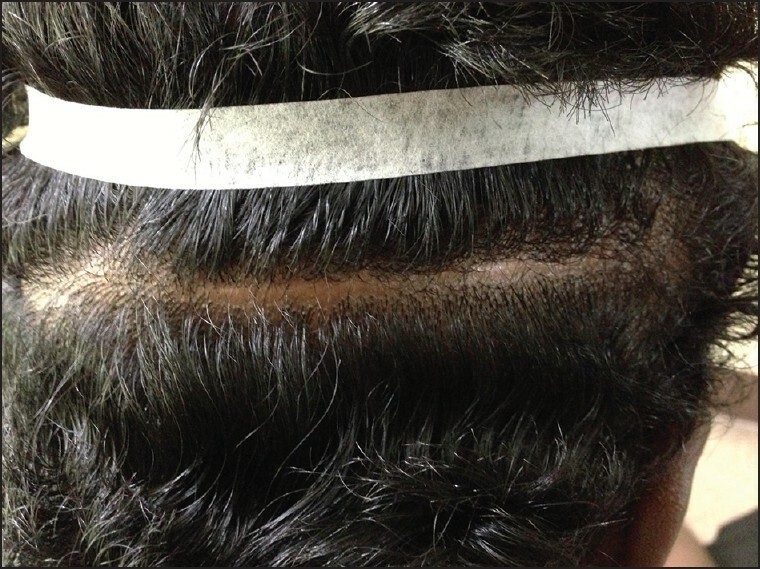 To study the outcome, efficacy and complications of staples for closure of the donor area following follicular unit transfer (FUT) in hair transplantation. Fifty consecutive patients who underwent staple closure of the donor area following FUT from January 2012 to October 2012 were included in the study, and their data regarding surgical technique, course during recovery, follow up and complications, if any, were collected retrospectively from the case files. The width of the donor area was kept at 1 cm in all the cases. Dissection of the donor tissue was performed up to the level of subcutaneous fat, leaving a thin layer of fat at the floor of the wound. Wound was closed in single layer using staples without undermining. Ethicon® staples (proximate plus MD 35W) were used. Staples were placed at a distance of approximately 3 mm to 5 mm from the previous one. Staples were removed at the end of 15 days. If there was post-operative discomfort to the patient, alternate staples were removed at the end of 10 days and the rest were removed at the end of 15 days [Figure 1]. Patients were followed up one year after the surgery and photographic documentation of the scar at the donor site was done. Objective measurement of the width of the scar was done for all the patients. The point at which the scar width was the maximum at the centre, at the right half and at the left half along the donor closure line was noted. The average width in mm was taken as the final reading. Institutional ethics committee approval was obtained for the study. Out of 50 patients, 49 were male and one was female. Age group ranged from 23-58 years. The average length of the donor area was 22 cm. The minimum width of the scar was 1 mm and the maximum was 4 mm [Figure 2] and [Figure 3]. The average width of the scar was 1.82 mm [Table 1]. Forty out of 50 (80%) patients had post-operative discomfort due to the staples. One patient had post-operative bleeding from the wound closure site, and suturing was done at that site to arrest the bleeding. Twelve (24%) patients complained of itching at the staple site. 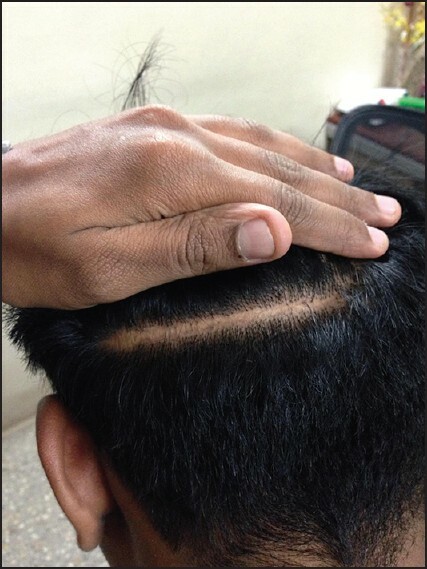 Ten (20 %) patients complained of visibility of staple showing through the hair. One patient developed a hypertrophic scar [Figure 4]. There was no infection or tissue necrosis at the staple closure site in any of the patients. The scalp laxity was not the same in all the patients, and no objective measurement of scalp laxity was done in the study group. We observed in our study group that it is difficult to have a good control on the edges of the wound while closing with staples. A good haemostasis was not observed, and one patient had an episode of bleeding at the staple site later, on the same day of surgery, which was treated with a simple suture at that site. Staples at times get displaced from the original site along the line of closure while the patient lies supine during the implantation process; this could be due to the pressure on the occipit while lying supine. This migration of staple did not lead to wound dehiscence or bleeding. Majority (80%) of the patients complained of post operative discomfort at the staple site which lasted for a week; however, they later get accustomed to the staples. Removing the alternate staples made the patients tolerate the staples better. Twelve (24%) patients complained of itching at the staple site from day three after the surgery. This may be due to the crusting along the line of closure. 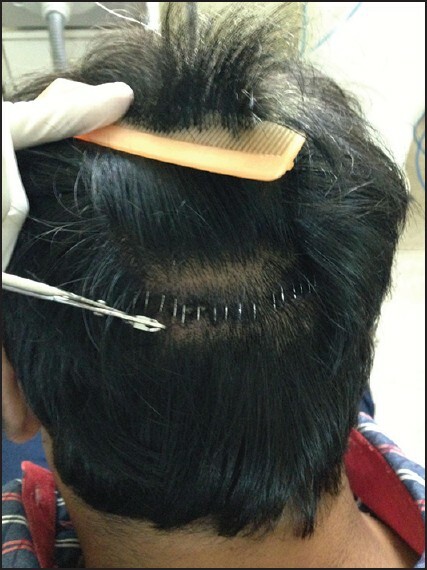 Ten patients complained of visible staples at the back of their head. Keeping the hair length longer prior to the surgery would prevent the see through effect of staples. One patient had hypertrophic scar at the staple site by the end of 4 months which was treated with topical steroids. None of the patients had infection or tissue necrosis along the line of closure. Occasional pain was experienced by the patients while removing the staples. However, this was not a major problem in our study group. 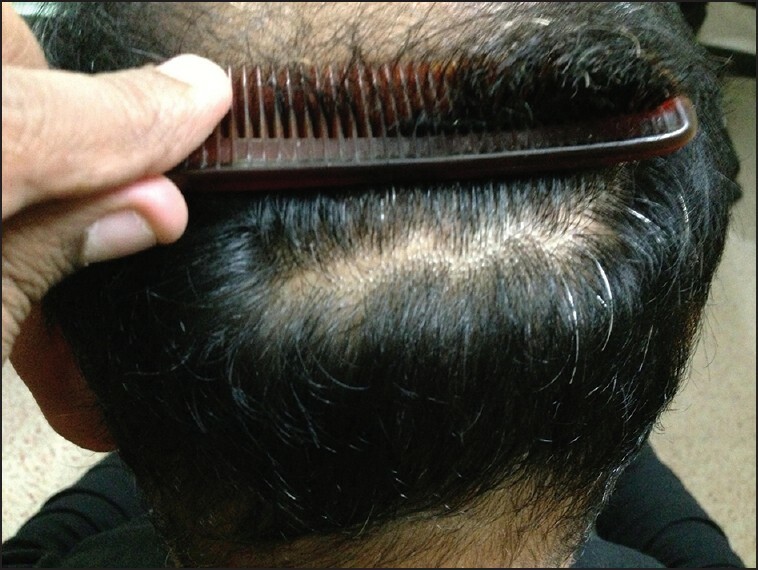 Every technique followed in donor closure for FUT has benefits and limitations with respect to healing, comfort, avoiding the damage to the follicles, cosmetic outcome and convenience for the patient. No one technique possesses all the desirable characteristics. Staple closure results in a wider scar when compared to sutures and leads to more post-operative discomfort. The potential to conserve the hair follicles along the line of closure outweighs these disadvantages and makes using staples worthwhile if conservation of follicles is the goal. 1. MR Goyal. Mechanics of Biomaterials: Sutures after the surgery. Application of Engineering Mechanics in Medicine. Mayaguez: GED-University of Puerto Rico; 2005. 2. Israr M, Stassen LF. The comparison of scalp closure with staples, silk, prolene and vicryl following a Gille's temporal approach for malar/ zygomatic complex fracture; a prospective study. Pak Oral Dent J 2013;33:3-7. 3. Lammers L. Principles of wound management. In: Clinical Procedures in Emergency Medicine. In: Roberts J, editor. St. Louis: WB Saunders; 1988. p. 533. 4. George TK, Simpson DC Skin wound closure with staples in the accident and emergency department. J R Coll Surg Edinb 1985;30:54-6. 5. Edlich RF, Rodeheaver GT, Thacker JG, Lin KY, Drake DB, Mason SS, et al. Revolutionary advances in the management of traumatic wounds in the emergency department during the last 40 years: Part II. J Emerg Med 2010;38:201-7. 6. Jewell ML, Sato R, Rahija R. Comparison of wound healing in wounds closed with staples verses skin sutures. Contemp Surg 1983;22:29-32. 7. Stillman RM, Marino CA, Saligman SJ. Skin staples in potentially contaminated wounds. Arch Surg 1984;119:821-2. 8. Newsberry L. Sheehy's Emergency Nursing Principles and Practice. 4 th ed. St Louis: Mosby year book Inc; 1998. 9. Slade Shantz JA, Vernon J, Morshed S, Leiter J, Stranges G. Sutures versus staples for wound closure in orthopaedic surgery: A pilot randomised controlled trial. Patient Saf Surg 2013;7:6. 10. Smith TO, Sexton D, Mann C, Donell S. Sutures versus staples for skin closure in orthopaedic surgery: Meta-analysis. BMJ 2010;340:c1199. 12. Bernstein RM. Staples revisited. Hair Transplant Forum Int 2008;18:10-1. 13. 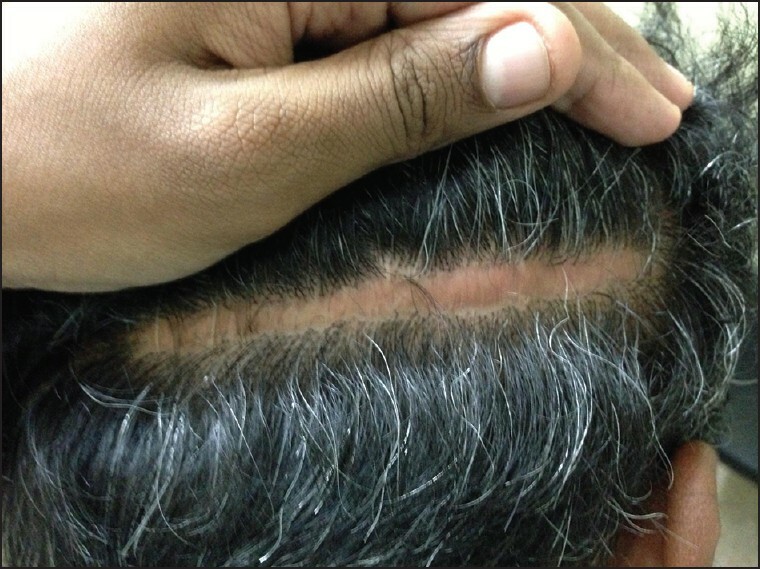 Bernstein RM, Rassman WR, Rashid N. A new suture for hair transplantation: poliglecaprone 25. Dermatol Surg 2001;27:5-11. 14. Khan AN, Dayan PS, Miller S, Rosen M, Rubin DH. Cosmetic outcome of scalp wound closure with staples in the pediatric emergency department: A prospective, randomized trial. Pediatr Emerg Care 2002;18:171-3.